It’s impossible to describe a country as vast as India as just one thing. Its cities sizzle with energy; its countryside has a sleepy, dreamy quality; and everywhere you go, there are swirling colors, stunning architecture, and some of the most hospitable people you’ll ever encounter. Far too many travelers come to India only to tick the Taj Mahal off their bucket lists — that is if they bother traveling here at all. India continues to be underrepresented on people’s lists of dream destinations, and even fewer want to road trip through it. With an infamous traffic scene, frequent language barrier, inconsistent road quality, and not that many predecessors to base your itinerary around (Route 66 this is not), a road trip through India could sound more like a nightmare. But in reality, the challenges only add to the experience, making for one of the most fun, fascinating trips you’ll ever take in your lifetime and bringing you closer to the soul of this vibrant country. I’ve explored the world by car, logging nearly 100,000 miles on out-of-the-way roads through Iran, China, the Pamir Mountains, and more. Yet I always return to India. 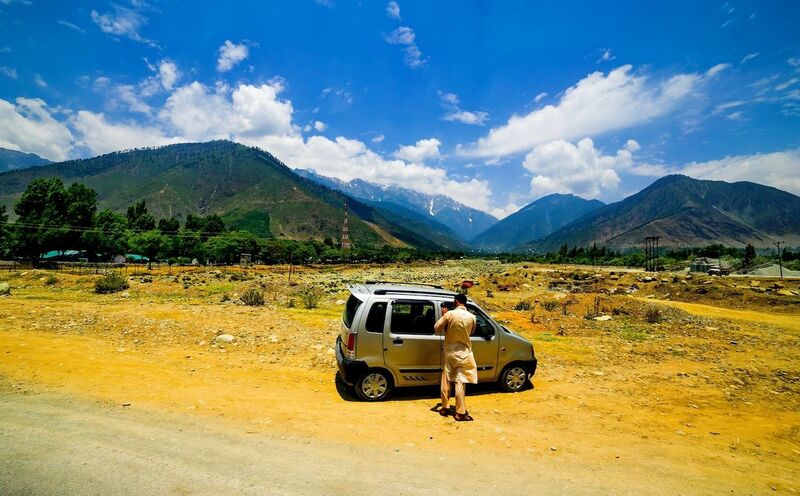 On five self-drive explorations, my partner and I crisscrossed India from Rajasthan to Nagaland and from the southern tip of Kerala to Kashmir. Here’s why we’ve done it, why we keep coming back, and how you can do your own self-drive road trip through India, too. 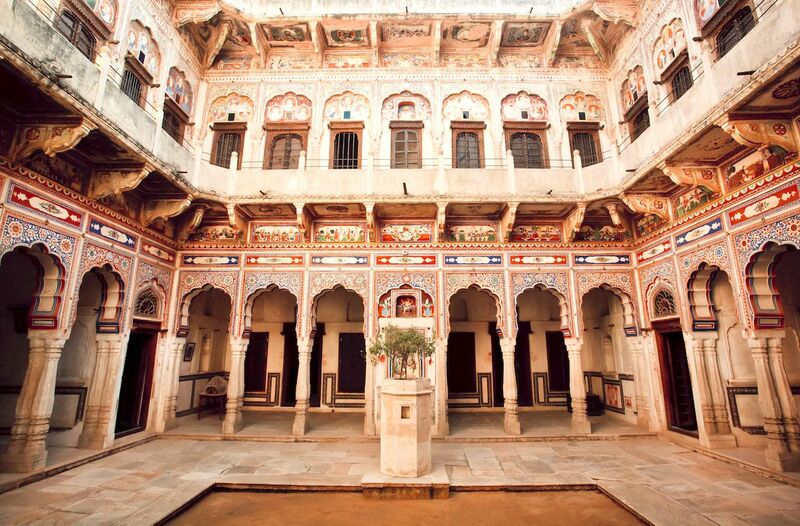 None of our India road trips are centered around historic monuments or empty fortresses. The reason we drive ourselves is to get an unparalleled view of ordinary life — to see what’s out there firsthand, when and how we want. Instead of being holed up in some luxury tourist resort far removed from anything resembling real India, you’ll be able to experience the country as locals do — buy your fruit from the same street vendor, curse at the same potholes, wait for ages at the same railway crossing, have your flat tire fixed at the same repair stall, and, more than likely, stop and drink from the same kettle of tea together. Everything you hear about the madness of Indian traffic is true. Wonderfully so. The chaos is mesmerizing and terrifying at the same time. Any Indian who hears you’re driving yourself will ask, “Why drive when you (as a traveler who can afford to get to India) can afford to hire a driver? !” Even affluent locals will hire full-time chauffeurs. Yet being driven around like Miss Daisy misses the point entirely. If you want to see India on your own terms, there’s no other way to do it than to drive yourself. There are several things you will need to do, though, to prepare for this unique journey. Get an International Driver’s License from your local AAA, which will be valid for 12 months. Carry along your home-state driver’s license and your passport. India issues tourist visas swiftly through this portal. Craft a route outline while still at home with your daily start and end points. When choosing each day’s ultimate destination, try to keep under 150 miles (250 km) a day, ending at a decent accommodation. Leave the finer points of how to get there, and what to do along the way, to the night before each day’s drive. Generally, we do our utmost to avoid the obvious straight road to anywhere. If someone says, “That way is shortest” — or fastest, smoothest, easiest — I seek an alternative that is as wiggly and narrow as I can find. This makes the driving harder and the days longer than they have to be, but it multiplies the opportunities to wander through tiny villages, hang out with buffalo herders at the local watering pond, share cashew biscuits with a local guru and his mother, etc. 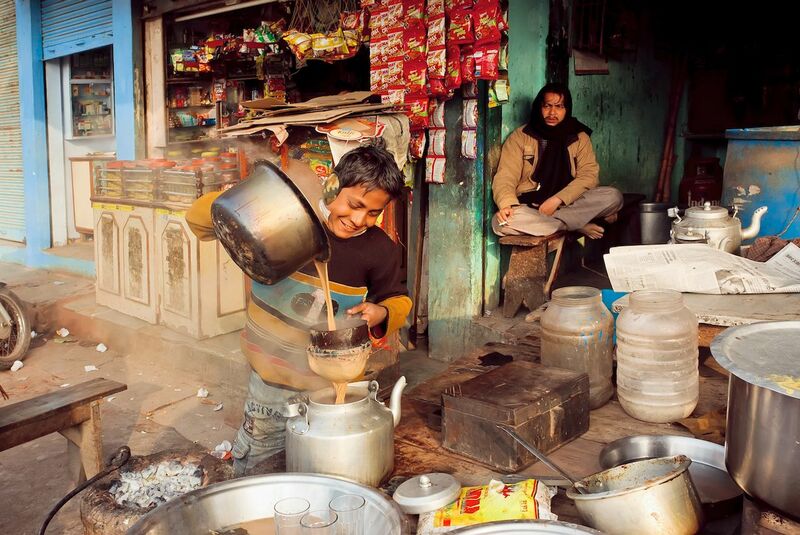 Our unexpected presence and obvious foreignness startle India’s endlessly hospitable people into nearly yanking us off the street and into their homes for a cup of chai, eager to spend time with us and display their catch to their neighbors. We typically move on after no more than two nights in a place, the point being to absorb a vast stretch of country and thereby develop a sense of the subtle differences in how life is lived from one village to the next. This is traveling in broad brushstrokes, interrupted by serendipitous encounters so personal, so impromptu yet intense, that they are simply unforgettable. Stay flexible. 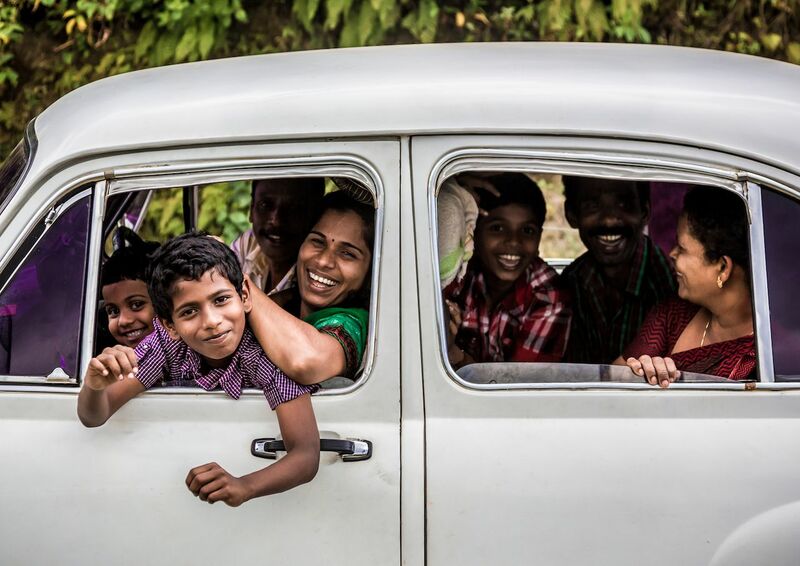 Driving through India is all about responding to the moment. How long you drive and how you choose to reach the day’s destination depend on many things. Are you perky or pooped? Is one of you (or both) feeling sickly? Did you discover from a chat on the terrace the night before that there’s a gorgeous lake (or horse-breeding barn, or wedding) that you want to see? Have you just learned that a bridge has collapsed or a road been closed for a demonstration? Adapt to the inconveniences and embrace spontaneous opportunities. Surprisingly, India only recently started having rental-car agencies en masse. Major cities have outlets for Avis and Hertz, but they don’t run on the same easy-driving principles as in the US. For instance, not every rental company permits its vehicles to cross state lines although India has 29 states, and some don’t permit one-way renting. If you choose to rent, be as specific as possible about the states through which you may venture. Err on the side of more as opposed to less. The agency will need to provide you with insurance and tax payment vouchers confirming that the car is authorized in every state you enter. Don’t rent from individuals or off-brand rental companies. If you do go local, go with a well-established firm like Zoomcar that has a track record of at least several years in business, offices throughout the country, and new or new-ish cars. As anywhere, breakdowns and accidents can happen. If they do, you’ll want to have a reputable company with trained personnel to assist you. Insurance is essential and inexpensive. You can buy it at the agency rental desk or before you go from a provider like RentalCover.com. Whatever option you choose, go with a company that allows you to take your car across state lines and provides full-coverage insurance. This means both third-party liability in case of injury, death, or property damage caused to any third party who is not in the insurance contract in an accident, as well as comprehensive coverage for loss or damages to your car. 5. India is a right-hand-drive country. You drive on the left side of the road, which makes sense since Britain developed India’s road system during the Raj when it ruled over India until Indian independence in 1947. All rental cars have the steering wheel on the right side, the side where, in the US, the passenger sits. For Americans, this definitely takes some getting used to. To minimize the stress of this confusing setup, rent a car that’s an automatic. This eliminates one of the challenges of right-hand driving: manipulating the stick with your left hand. Also, pick up your car far outside the city center. Most agencies insist on delivering the car to you (and picking it up at the end, too). We arrange for the rental company to bring our car to the city outskirts and take a taxi to the meeting spot. 6. Create and use departure and arrival rituals. 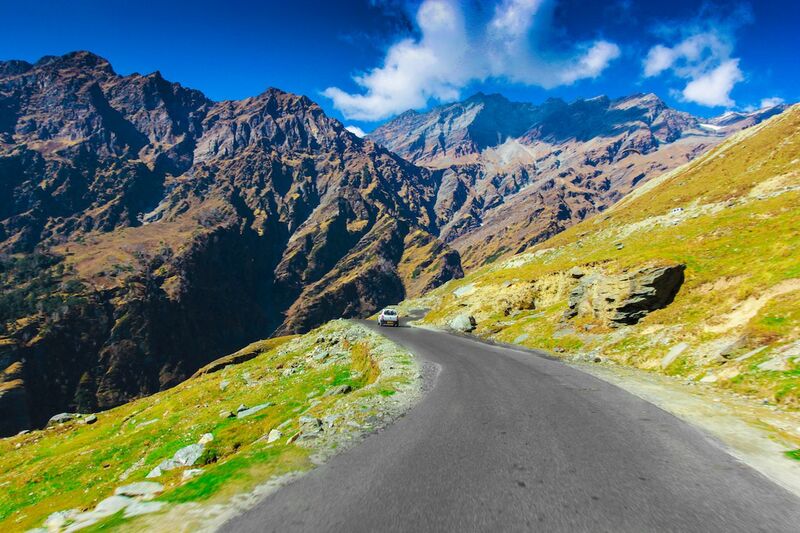 So much is attention-worthy on an India road trip that the mind quickly gets overloaded. That’s when important things get left behind or go missing. Have a ritual for each day’s departure and each evening’s arrival. Think of it as your personal five minutes of mindfulness before returning to life inside an exploding fireworks factory. Ensure you have everything and that everything has a place because stopping by the side of the road to get that map left in your suitcase isn’t always an option. Put everything in the same place every day: water, roadmaps, phone/GPS plugged in and turned on, camera and sunglasses, snacks, vehicle insurance, and driver’s license. And be sure to take everything valuable to your room at the end of the day. Once you reach India, accept that each morning you will eventually have to leave the predictable, quiet, stationary haven that is called “parking lot” and enter the cacophonous, jam-packed roads of India. In that outer world, thousands of things will be moving at once, in all directions and within inches of each other — and therefore of you. Don’t get overwhelmed or angry — just take a deep breath and do your best to navigate through it all, having as much fun with the experience as possible. The overload of sensory stimuli that comes with road tripping in India can be as exhausting as it is invigorating. Eventually your safe spot, where you can let your breath out, will be your car. Take your time. This is key. 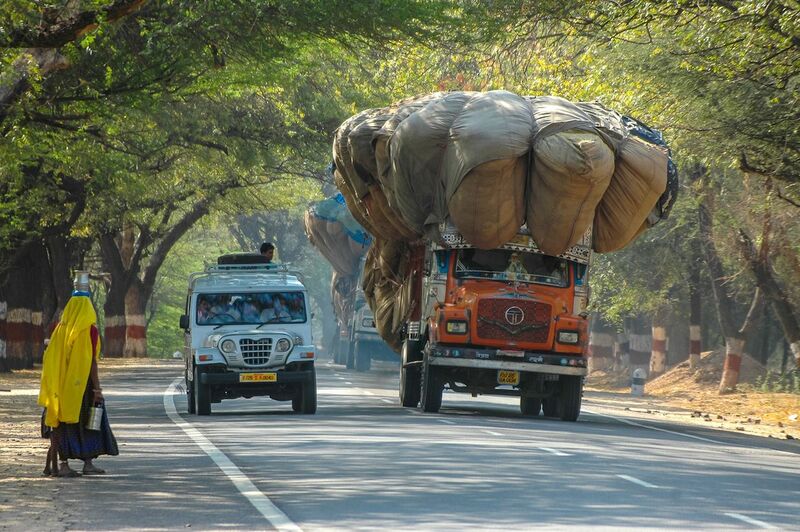 Drivers throughout India are adept at passing. They will find a way to get around you if they need to. Just let them go on their swift ways and drive at the pace that suits you. Follow good advice to prepare for right-hand driving. And always, without reservation and with gusto, honk. American cars have horns, which we never use except in case of emergency, but in India, it’s used all of the time. Get over that inhibition about making noise and plan on having one hand on the horn so you can push it frequently and with ease. 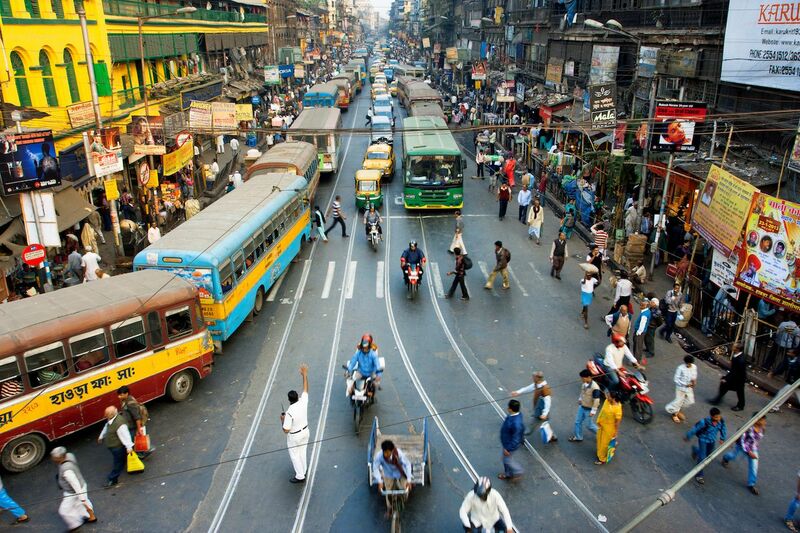 Safety on Indian roads, especially in cities, has everything to do with sound. Traffic moves according to who honks when. If you’re coming up behind someone and intend to move into their space, honk. If you’re going to pass, honk. If you want someone to move over, honk then move on around them. Don’t wait for them to nicely slow down or pull to the side to let you pass. The vehicle in front will ignore you completely, continuing its bothersome, blocking behavior as long as you’ll let it. Once you’ve honked, timing is everything. Hesitate a split second and the truck creeping along at half a kilometer per hour has pulled right into your lane. 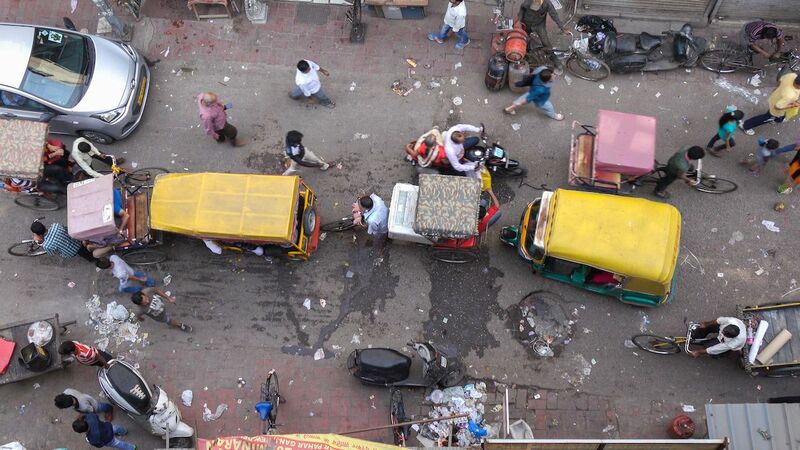 Or a phalanx of rickshaws is now scattered across the causeway like buckshot. Our mantra is “No guts, no glory.” It is our only hope of ever arriving at our hotel before dark. The most vulnerable adversaries initially seem to be animals. 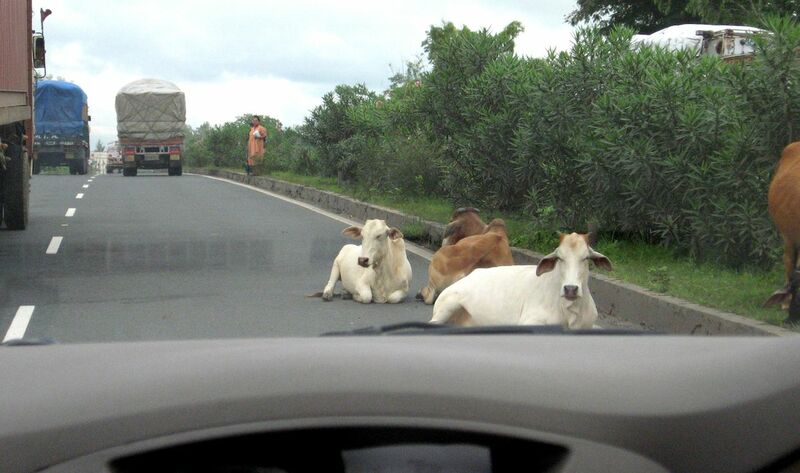 However, dogs and cows seem to know that no one will dare hit them on purpose, so they don’t move. Pedestrians, bicyclists, and rickshaw pullers are in the second most vulnerable category; it stuns me that they, too, rarely move out of the way. Either they consider themselves in the karmic protected category or are so deafened by incessant honking that they don’t hear us bearing down. Every single truck, bar none, has PLEASE HONK or BLOW HORN emblazoned in decorative, multi-colored script on its tailgate. They are dead serious. To prove it, they remove their outside mirrors so they can’t see behind them, the message being, “Your call if you want to pass me — but you better make yourself heard, because bro, I can’t see nothing behind.” More than any unwritten rule of the road, this inability to see behind puts the entire burden of safe passing on the driver who wants to get by. If you are ever hit by a truck, there can be no dispute about whose fault it is, unless that truck is behind you. 10. Be aware of police blocks. Sometimes on back roads, you will come upon a random police checkpoint. There’s nothing illegal or dire about these, so keep your cool. Expect the best from the officer and show courtesy. Don’t offer a bribe. This insults the officer who’s just doing his job. Also, don’t create a situation where a petty official can’t answer a question simply by looking at your passport and visa stamp. Flag the passport page which has your India visa. Keep all car papers within easy reach along with your international driver’s license. Be prepared to say a sentence or two in easy English that explains where you’re going and what you’re doing. Make 10 copies of all documents, car and personal, and keep them in a plastic pouch at hand for when an official believes he has to have a record of your existence in his district. Smile. A good strategy is to make the best, clearest color copy of the photo and signatures pages of your passport. Shrink to credit card size, so you can fold it in half, laminate it, and carry it in your wallet. India is still new to travel, and millions don’t even have passports. They have identity cards. When a petty official asks for my passport as identification, I give him this pseudo-ID card instead. Ninety-nine percent of the time that satisfied his curiosity, and I’ve kept my passport safely out of reach of border-patrol officers. Buy and use paper maps along with your GPS. There’s no substitute for paper maps in India if you want to understand route opportunities in the area. Don’t be hesitant about those tiny roads. 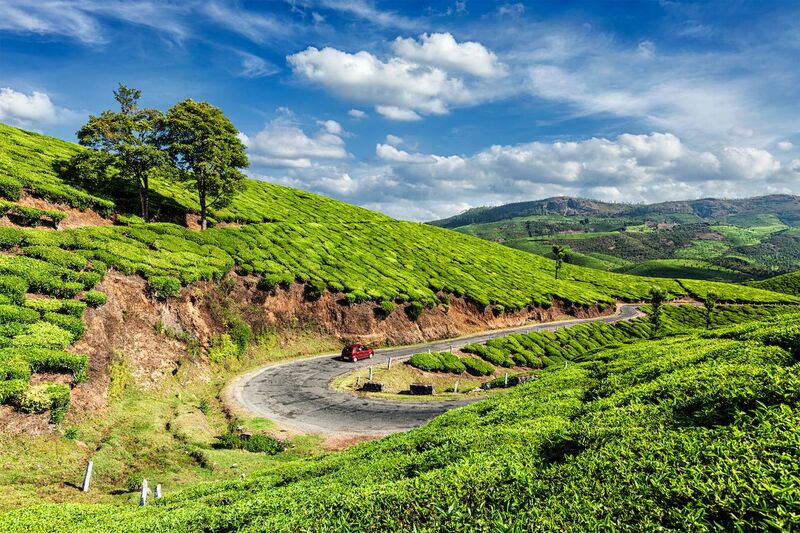 Self-driving through India is all about getting yourself onto the small roads, which lead to country lanes that take you right through the village heartbeat of India. I recommend Reise brand maps for their detail, accuracy, and indestructibility. For GPS, Google Maps is great, but you can also support the guidance with Map My India, which has created affordable GPS systems with tremendous local detail for drivers. As for nightly shelter, I’m all for being sweaty and dirty during the day and pampered at the end. That means a hotel where a shower and good bed set you up for everything the next day will offer. Yet you don’t necessarily have to book all your hotels in advance. All of India’s heritage hotels — stately homes and palaces that belonged to maharajas and nawabs — are worth a stay. They exist pretty much everywhere, ranging in price from budget to five-star. Though you’ll notice a difference in quality and upkeep, each one is full of character. The hotel receptionist will be happy to advise on places to stay at your next destination and even call ahead to reserve for you.